Get Free NCERT Solutions for Class 10 Maths Chapter 6 Ex 6.5 PDF. 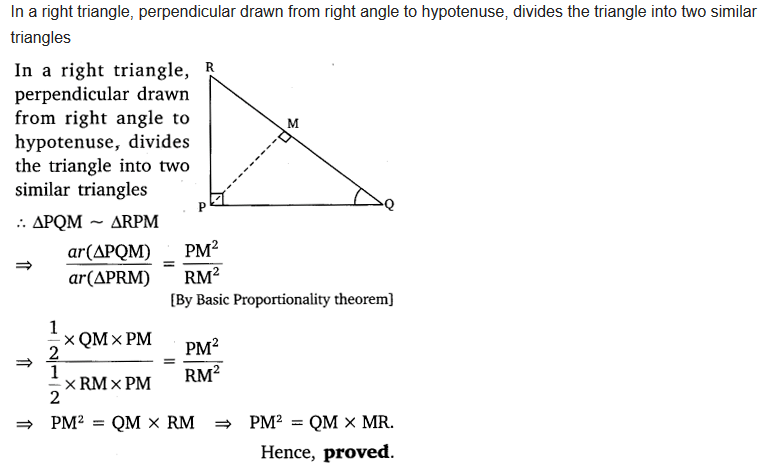 Triangles Class 10 Maths NCERT Solutions are extremely helpful while doing your homework. Exercise 6.5 Class 10 Maths NCERT Solutions were prepared by Experienced LearnCBSE.in Teachers. 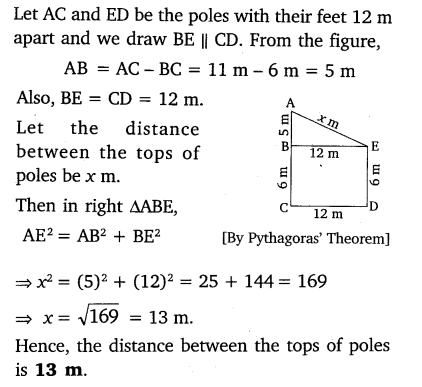 Detailed answers of all the questions in Chapter 6 Maths Class 10 Triangles Exercise 6.5 provided in NCERT TextBook. 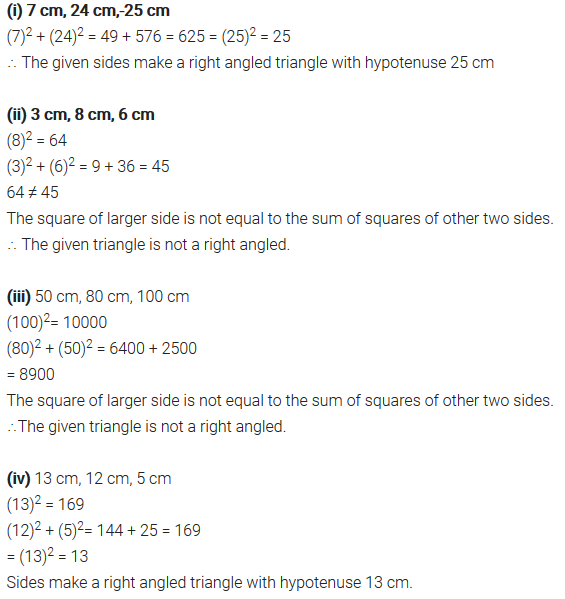 You can also download the free PDF of Ex 6.5 Class 10 Triangles NCERT Solutions or save the solution images and take the print out to keep it handy for your exam preparation. Sides of triangles are given below. Determine which of them are right triangles. In case of a right triangle, write the length of its hypotenuse. PQR is a triangle right angled at P and M is a point on QR such that PM ⊥ QR. 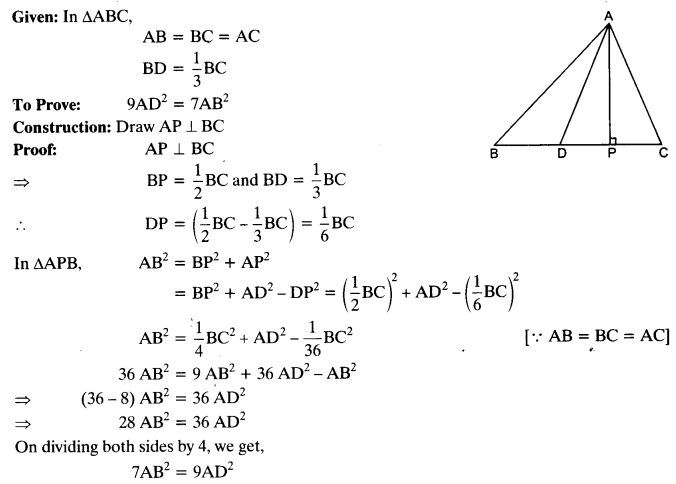 Show that PM2 = QM X MR.
ABC is an isosceles triangle right angled at C. Prove that AB2 = 2AC2. ABC is an isosceles triangle with AC = BC. 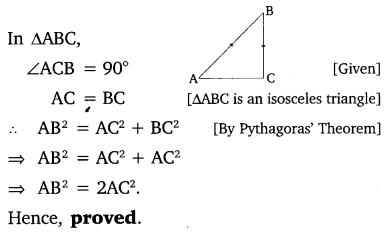 If AB2 = 2AC2 , Prove that ABC is a right triangle. 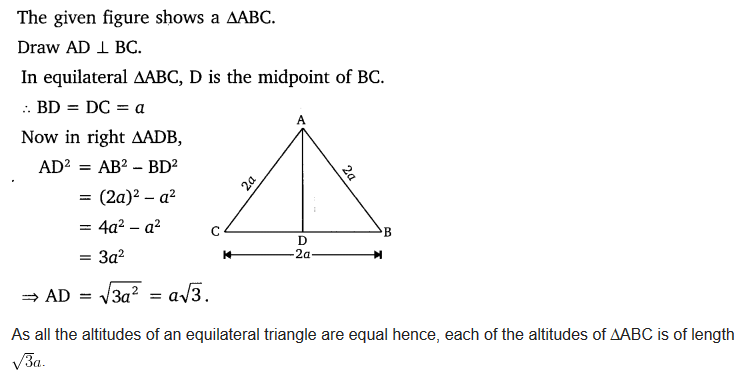 ABC is an equilateral triangle of side la. Find each of its altitudes. Prove that the sum of the squares of the sides of a rhombus is equal to the sum of the squares of its diagonals. A ladder 10 m long reaches a window 8 m above the ground. ind the distance of the foot of the ladder from base of the wall. Two poles of heights 6 m and 11m stand on a plane ground. 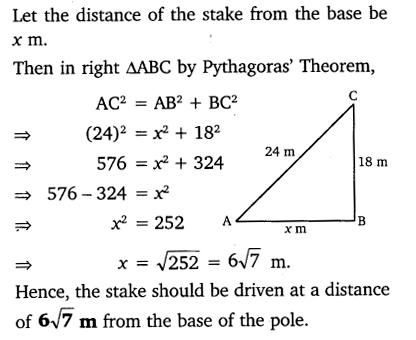 If the distance between the feet of the poles is 12 m, find the distance between their tops. 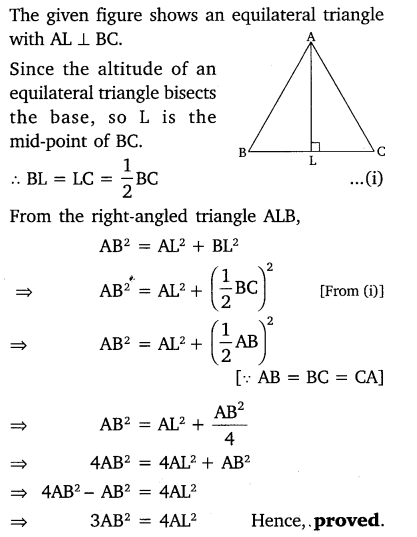 D and E are points on the sides CA and CB respectively of a triangle ABC right angled at C. Prove that AE2 + BD2 = AB2 + DE2. 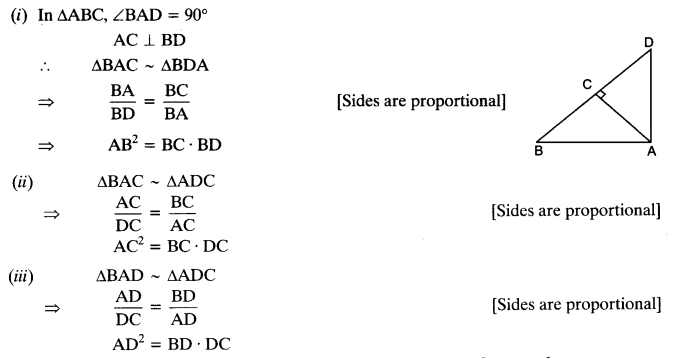 The perpendicular from A on side BC of a ∆ABC intersects BC at D such that DB = 3CD (see the figure). Prove that 2AB2 = 2AC2 + BC2. BC. 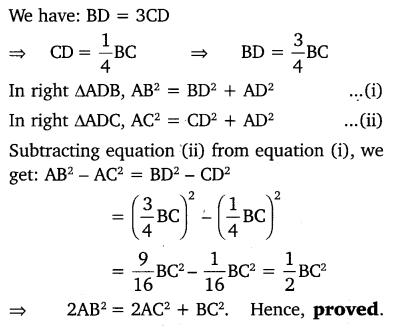 Prove that 9AD2 = 7AB2. 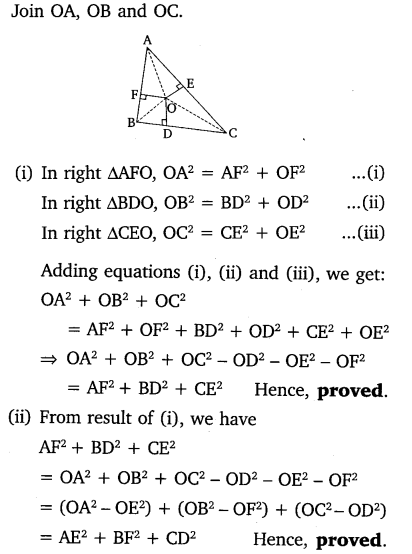 We hope the NCERT Solutions for Class 10 Maths Chapter 6 Triangles Ex 6.5, help you. 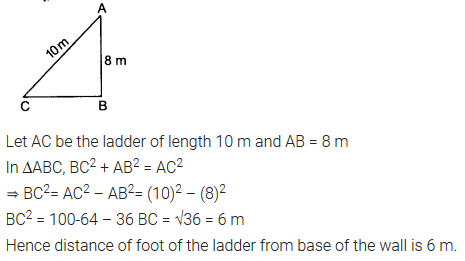 If you have any query regarding NCERT Solutions for Class 10 Maths Chapter 6 Triangles Exercise 6.5, drop a comment below and we will get back to you at the earliest.